Review of One of Galway's Top Art Galleries: Group/Solo Exhibitions, Artists, Opening Hours. Galway's Kenny Gallery has been selling original works of Irish art for more than 50 years. During this time it has hosted major exhibitions by Andy Warhol, Jack B Yeats, Paul Henry, Sean Keating, George Campbell, Kenneth Webb and Louis Le Broquy. The conversion of the bookshop to the largest commercial gallery of visual art in Ireland, took place in 2006, and extends over three floors. Kenny Gallery now sells fine art paintings, sketches, prints, sculptures and ceramics, plus a full range of art books. In addition, in line with its experience of the Irish art market, it offers an extensive advisory service for private buyers and corporate art collectors, to suit a wide variety of artistic and investment priorities. Current works on display at the gallery include those by: Pauline Bewick, Malcolm Bennett, Paul Guilfoyle, Betty Brown, Sheelan Browne, Linda Brunker, Anne Farrall, Kieran Tobin, Vicki Crowley, Fiona Joyce, Manus Walsh Doreen Kennedy, John Connery, Susan Webb, John Coll, Thelma Mansfield, Michael Gemmell, and Fran McCann. Artists should submit a number of digital images of recent works plus a profile/CV. 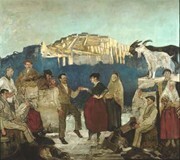  For details of other Connacht fine art exhibitions and collections, see: Irish Art Galleries and Museums.  For more about arts venues in Ireland, like Kenny Gallery, see: Irish Art Guide.